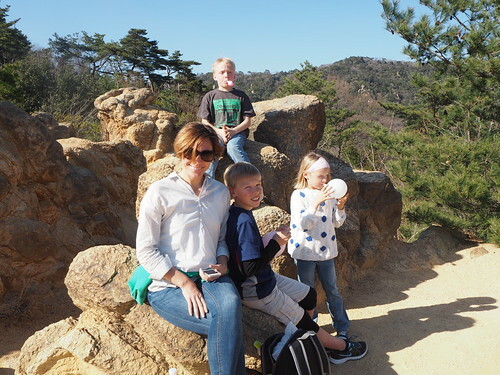 It was a glorious early spring day yesterday, so we took advantage of the perfect weather and hiked through Rokku Gaaden (Rock Garden in English) in the hills above Kobe. The 5 kilometer hike goes through the sandstone “badlands” to the summit called Fubukiiwaato (447 meters). The views of Osaka Bay and the Koshien metropolitan area were quite nice. I can’t get over how close the dense urban population is so close to the quiet, forested hills. It is much like Avila Park outside of Caracas, Venezuela. Nadia was a bit nervous climbing through the rocky bits, but seeing local senior citizens moving down the rocky paths, inspired her to power through. 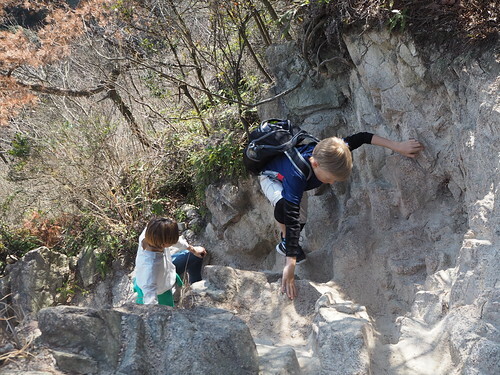 The kids loved scrambling over the rocks on the way up to the top. There were not that many people on the trail, considering it being a beautiful Saturday. 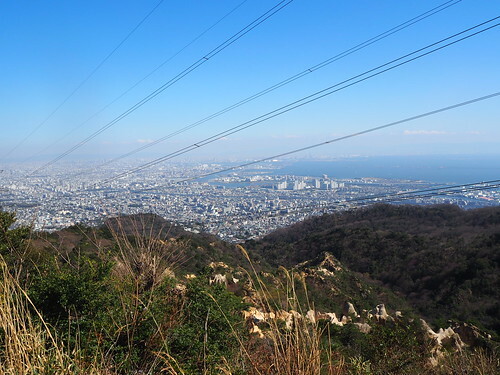 It is a great hike to do close to Osaka/Kobe and can be reached by public transport. We were disappointed not to see any of the famous wild boar, but it provided entertainment through the hike when one of us would snort like a pig to fool the others that boar were in the area. I did see the pygmy woodpecker for the first time and we discovered the source of a foul odor we have been smelling during this holiday. A bush that I think may be a Boxwood (Buxus sp.) has flowers that give an odor with a hint of small, rotting animal. We’ve been wondering what they were the past couple of days in our runs around Minoh and our visit to Kyoto earlier this week. I’ll have to look more into it and identify it. I found a description of the hike in the Lonely Planet’s “Hiking in Japan” which I highly recommend for residents and tourists wanting to get out and explore a bit of the countryside. There are 70 detailed hike descriptions including maps. We finished the day with a meal down at the Kobe Port waterfront. All and all, an excellent day with my family.